I was down in South Florida for a weekend and decided to do some sightseeing. My first stop was the Coral Castle. It was definitely an interesting place to stop, but they pushed too much of the woo with their theories of how the place was built. It seemed pretty well established and obvious how the castle was built, but this is a food blog, so I won't complain much more about roadside attractions adding more hype than actually surrounds a place. My next stop was the Robert Is Here fruit stand. I found out about this place their brochures in the rest stops along the Florida Turnpike, so they must be pretty touristy. There advertising works though, because I visited as a tourist. Robert is Here sells all sorts of tropical fruit that grows locally in the Redlands area south-west of Miami. They had some of your standard tropical fruit like mango and papaya (grown on the trees out back), but then there was more exotic stuff. They had locally grown Jackfruit, and then there was fruit I've never heard of. Besides from the tropical fruit, Robert is Here's milkshakes also seemed to be a big draw. I bought myself a key lime milkshake. This very thick shake tasted just like a key lime pie in a viscous, semi-drinkable form. Really good! I also had to buy myself some of the locally grown fruit. I choose a Florida Mango and a Mamey Sapote. When I went to pay for these two fruits, I found out why Robert is Here can afford to advertise in all of those Miami brochures. These two fruits came out to $8 and change. It seemed really overpriced to me, especially since mangos can often be found in supermarkets for under a dollar during the season. I was doing the tourist thing though and I really wanted to try the mamey, so I ended up buying th fruit anyway. Lately, mango has become one of my favorite fruits. I've noticed that there is quite a difference between fruits depending on where the mango is grown. If the mango comes from South America or Mexico, they have a lot more juice and are slighly stringy. A Florida mango doesn't have the stringyness and has a creamier texture. Out of the two types, Florida mangos are definitely my favorite. The mango that I bought from Robert is Here was a prime example of a really good Florida Mango. I bought the mamey sapote because I was totally unfamiliar with the fruit and the sign said it tasted like a pumpkin pie. You would never know from the brown fuzzy skin on the outside of the fruit that the inside flesh was a brilliant deep orange color. The flesh had the texture of an avocado and really did taste just like a pumpkin pie. This fruit could probably be put in a pie crust, and you would have an instant pumpkin pie with no work! It would probably be a lot healthier too! I've never seen a mamey in a store up in the Orlando area, but I'd definitely buy the fruit again if I see it! I ate at Victorio's II in Winter Springs, FL. I ate here a few times several years ago and decided to give them another try. I ordered an Eggplant Parmesan Sub and was really happy with it. The bread was nice and crunchy with sesame seeds on the outside. The eggplant didn't have any of that stringy skin on it and was breaded nicely. There was just the right amount of cheese and sauce on the sandwich, and I was happy! I've been to Dominic's II in Boca Raton, FL several times in the past, and they are consistently good. Their menu choices are a step above most other private Italian restaurants in the area, expanding from the standards of spagetti and lasgana. On this visit I tried their gnocchi. Bread and salad were served first, soon followed by the main course. The potato dumplings were very dense, served in a tomato sauce. I got the feeling that the gnocchi were homemade, but even if they weren't, they were still good. I'd gladly return to Dominic's again! 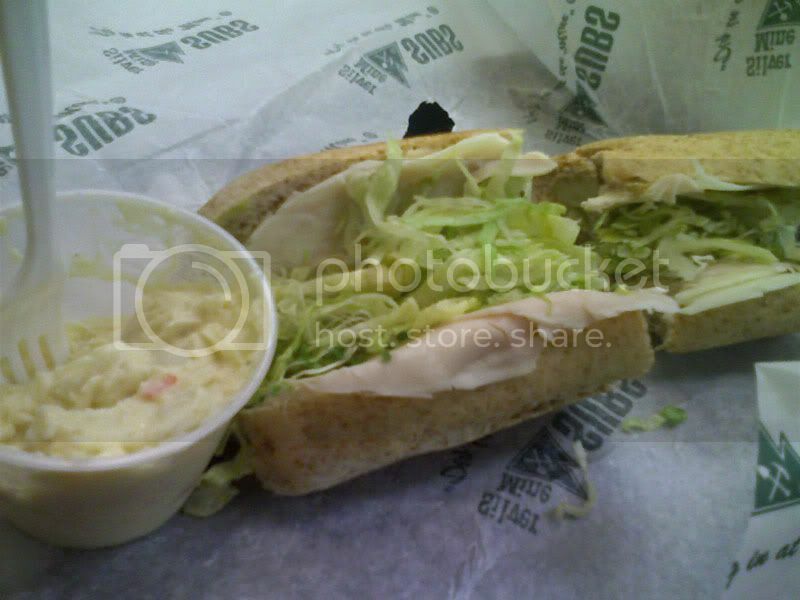 I ate at Silver Mine Subs in Orlando near UCF. I ordered the Caribou sandwich from the cold sub section of the menu. The sandwich consisted of turkey, provolone, lettuce, sprouts, mayonnaise, and guacamole. I was a little disappointed since the menu did not mention the guacamole. It said avocado came on the sandwich, so I was expecting actual slices of avocado. I do like guacamole, but don't tell me I'm getting avocado when it's only an ingredient in the guacamole. Regardless, it was still a pretty good sandwich, far superior to the nearby Jimmy John's. Continuing my day at Disney's Animal Kingdom, I had lunch at the Yak & Yeti Local Foods Cafes. 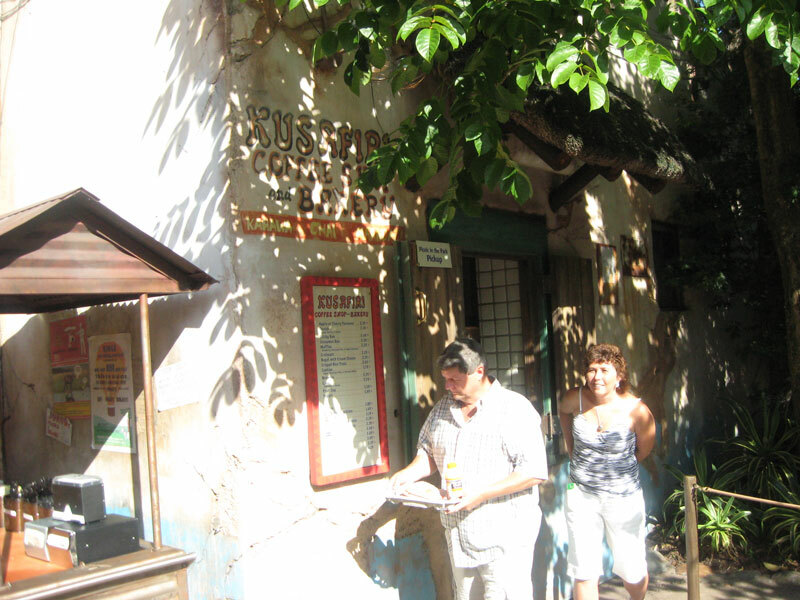 This is a fast food attachment to the full service Yak & Yeti restaurant with outdoor seating. I was considering eating at the actual full service Yak & Yeti, but after looking at their menu, I changed my mind. It seemed they had pretty standard dishes that you could get at any Chinese Restaurant, but charged about $30 per dish. The Local Foods Cafes also featured some pretty standard Chinese dishes, along with some burgers, all for much less money. If I wanted to spend top dollar on Chinese food, I don't think a Landry restaurant in a theme park is the best choice. I ordered the Shrimp Lo Mein. It had plenty of shrimp served over noodles with a somewhat limited selection of vegetables. It definitely could have used more variety when it came to the vegetables in the dish, but it was still pretty tasty. It was a whole lot of food too. Much more than what it looked like. I also split an order of Pork Egg Rolls. This had to be one of the greasiest egg rolls I've ever eaten. The hot oil was dripping off of the roll when I picked it up! I don't know what happened here, but it wasn't a good thing! Moving away from the food/restaurant pictures for the rest of this post, I'll say a few things about the new stuff in Animal Kingdom to please the obsessive Disney fans who cause a big spike in this blog's traffic whenever something Disney related is posted. First new thing was the whole carnival themed area that was added to Dinoland. I didn't quite understand the purpose of the whole area, except as a cheap theme to tie in some carnival rides. What do dinosaurs have to do with carnivals or roadside attractions? I went on the Primeval Whirl roller coaster while in this section of the park. Kind of a stupid ride, but it is what it is. I love roller coasters, but wild mouse coasters really do nothing for me. Last, I have to mention Expedition Everest. This ride was one of the highlights of the day. As far a themed roller coasters go, this is definitely one of the best, right up there with Thunder Mountain. Roller coasters always seem so much better when they build a fake mountain around the track. It had it's nice surprises and was really smooth. Only disappointment was that the robotic yeti wasn't working. Still, Expedition Everest is a really fun ride! I visited Disney's Animal Kingdom for the first time in several years. A whole lot was added since my last visit, and I had good time. Getting something to eat for breakfast was one of my first things I did at the park. I passed by a few restaurants that were open at 9:30 in the morning, but I didn't want a buffet (Tusker House) and another didn't sell simple breakfast items like bagels (Pizzafari). 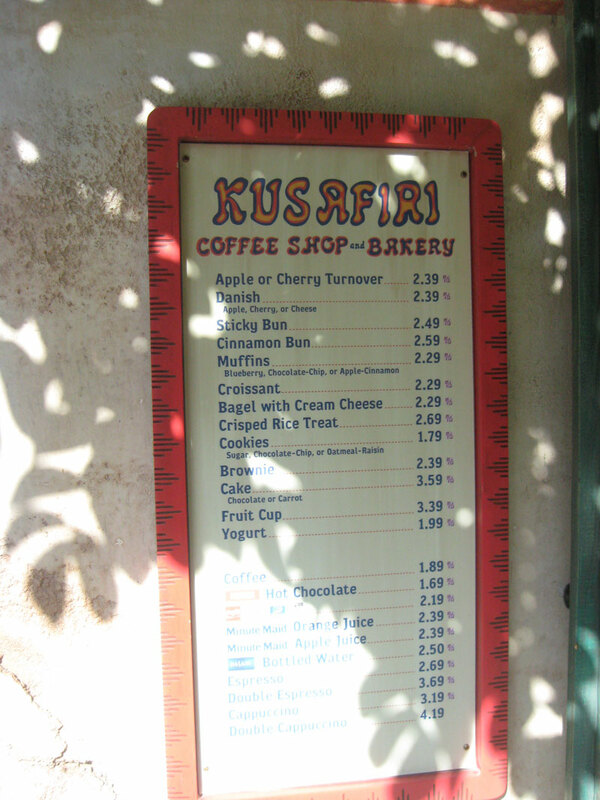 I eventually found the Kusafiri Coffee Shop in the Africa section of the park that had what I wanted. After reading over the menu, I changed my mind from a bagel and instead got a croissant. It was nothing extraordinary, but tasted like croissants should. 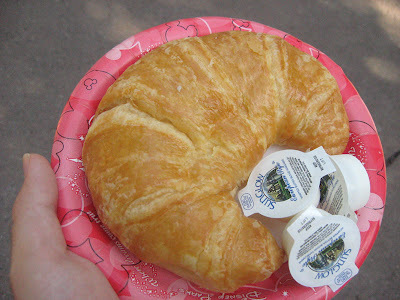 I ate the croissant on the go as I headed over to the Kilimanjaro Safari, then checked out some of the animal attractions, train ride, and Kali River Rapids. I've heard people complain that there isn't enough to do at Animal Kingdom, but if you take time to actually look at all of the animal exhibits, there is plenty. Animal Kingdom really is one of the best zoos around. I wonder what happened with those giant pandas that the park was supposed to get from China a few years ago? On a long drive home from New York, my fellow travelers decided that they needed to stop at a Starbucks to refuel on caffeine. I instead opted to get actual food and tried their Spinach and Feta breakfast wrap. It consisted of egg whites, spinach, feta, and some sort of tomato based sauce. It was better than I was expecting, but I really would prefer if they used whole eggs rather than just the whites. Egg whites may be healthier, but without the yolks they are tasteless with a consistency that I really don't like. Otherwise it was a good wrap from a coffee chain that isn't known for their food. Driving home from New York, after sitting in almost non-stop traffic all day long, we stopped and ate some Indian food at Taste of Tandoor in Woodbridge, VA. The meal was started with a garlic naan appetizer. They called it garlic naan, but I didn't taste any garlic. I tried the Tandoori Salmon for my main course. The salmon was brought out on a sizzling skillet and was transferred to another plate by the waiter. I had never tried seafood from an Indian restaurant and I was pleased. The salmon was really good in it's orange yogurt sauce, cooked with onions and lime. I wonder how many other people traveling along I-95 during an 1800 mile trip stop to eat Indian food? I've spent plenty of time in New York, but one thing I never did was walk over the Brooklyn Bridge. I've read on travel websites that the walk over the bridge is one of the top ten tourist destinations in the city, and yet I had never gone. On my last night in the area, I decided to walk over the bridge and eat dinner somewhere within walking distance of the bridge. We parked in Brooklyn and my initial thought was to eat at the famous Grimaldi's Pizzeria before the walk, but the line halfway up the block changed my mind. Instead, we proceeded over the bridge towards Manhattan. Walking on the wooden boardwalk above the cars was a great experience. There were great views and the bridge was packed with mostly international tourists. Even on the way back, close to midnight, there were still plenty of people on the bridge. It was also really interesting to inspect the bridge up close rather than speeding by in a car. Old suspension bridges like this are so substantial and nice looking compared to the cable strung bridges that have replaced them. Once in Manhattan, we headed towards the South Street Seaport. Since it was pretty late by now, we didn't want to risk restaurants closing for the night, so we ate at one of the first restaurants we came to. It was a Mexican Restaurant called Red. Tortilla chips and really good salsa were served first. I ordered a chicken and avocado tostada for my meal. It was basically a salad in a bowl made from a fried tortilla. The chicken had a really nice lime flavor, but the avocado wasn't ripe and was really hard. Overall, the meal wasn't great, but it wasn't bad either. Pretty much an average salad. I really like these Italian bakeries! I was planning on getting a bagel one morning, but then remembered the Monreale Bakery in Franklin Square, NY that I remembered passing a few days before. I decided I'd stop in and get some other type of bread. I was greeted by racks of freshly baked bread in the window, and then cases of Italian cookies and pastries in the cases inside. I bought some bread and also had to try some of the desserts, so I selected a few to try. I took the food back to the house, all in this great box tied with red and white string. I had this Semolina Roll topped with sesame seeds for my breakfast. Although it doesn't show in the picture that well, bread made from semolina flour is more yellow than your standard white bread and tastes a whole lot better! Later on, I tried the desserts I bought. I tasted this really good cannoli first, stuffed with it's ricotta filling. I also tried this dessert. I'm not sure what it's called, but was similar to a empanada filled with the same ricotta filling as in the cannoli. It was good! These Italian Bakeries seem to be all over this area of Long Island and Monreale was a good one. Question time: Anyone know of a good Italian Bakery like this somewhere in the Orlando area?